I've always liked Gossamer Gear packs. There motto "Innovative. Ultralight. Affordable." resonates with my frugal engineering mind. I've used my Mariposa Plus with satisfaction for several years now and I also got a G6 Whisper on sale because I simply had to (Who can resist to buy a 100g 35l pack for just 40$?). It was thus with enthusiasm I received the relatively new Murmur Hyperlight backpack for trial just in time for the SBM 2010. The interesting question is now whether these compromises will make the pack usable for a say a 3-day trip trip in the Scandinavian mountains. Will it be comfortable enough for the loads involved? Will it be durable enough? How practical is the pack in use? I will try to answer these questions in four sections: Load carrying comfort, Durability, Practical comfort. Please keep in mind that these are my initial findings and a long-term report will also follow. 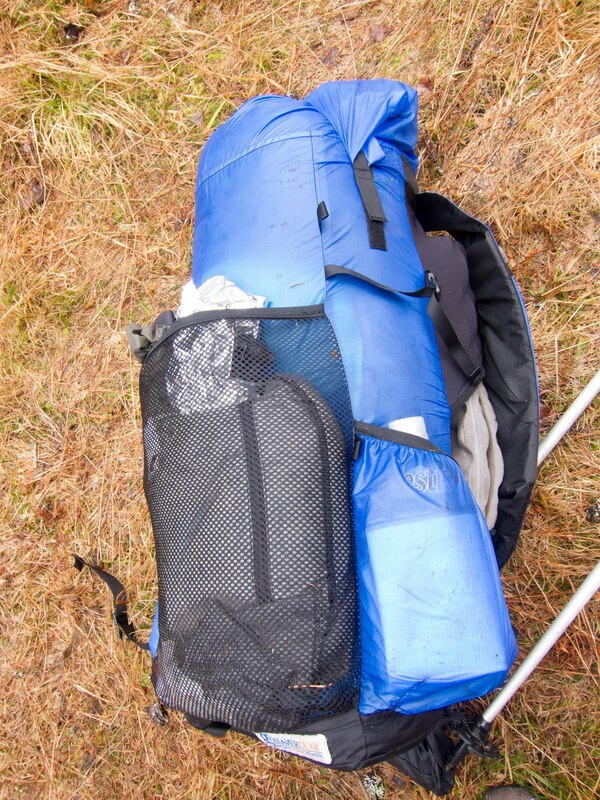 Many people will immediately dismiss ultralight packs thinking that the load carrying system is inadequate for normal loads. That might be true for traditional loads of 10-20kg, but when you have reduced the pack weight below 10kg, you don´t really need an advanced system. In fact, the UK hiker Colin Ibbotson frequently carries his light pack slung over just one shoulder! That being said the Murmur actually includes quite a few features to improve comfort. The shoulder straps are wide, there is a small webbing hip-belt and the sleeping pad pocket makes it easy to create a reasonably stiff backpanel. I found the pack to be quite good at carrying loads around 8-9kg. However, although the shoulder straps are wide, I found them to be a little too stiff and I found they could be a bit more comfortable. Some other hikers testing the pack also reported having an issue with the straps. My Gossamer Gear Mariposa Plus pack has the same kind of shoulder straps and I find these to be more comfortable. Probably because the padding has softened a bit through use. A unique feature of Gossamer Gear packs is that the padding can be replaced, by for example socks, and a few grams can thus be saved. I´m not really interested in shaving grams that way, but this also allows experimentation with other padding materials. I´m going to try and use a softer foam pad. The pack also has a removable sternum strap and it works well. My first thought when seeing the simple unpadded hip-belt of the Murmur was that its main function was just to stabilize the pack, but in practice I found it to work very well in shifting pressure from the shoulders to the hips. It also allows to carry the pack a bit further from your back which can be nice in hot weather. I used my Gossamer Gear NightLight torso length in the pad pocket and I found this to work perfectly. It gives the back-panel all the stability you need for these loads. The NightLight is also perfect to pull out during rest stops. Overall I´ve found the Murmur comfortable for the loads it is designed for. Especially when using the hip-belt. Apart from softer more contoured shoulder straps I see no need to add any more carrying system features. I´m reluctant to say much about durability after such a short test-period, but I find that compared to the Murmurs predecessor the G6 Whisper, it is a lot more durable. Apart from being careful when picking the pack up, I´ve made no efforts to baby the pack. The pack has already bushwacked a lot through pine- and spruce forest and still it shows no signs of wear. Switching to 1.3oz Sil-Nylon was a good choice. Spinnaker really is too sensitive to abrasion. I was worried that my camera tripod would tear holes in the fabric, but that fear has so far been ungrounded. The seams have also been thoroughly tested since I overstuffed the sack quite a bit. It really has been stuffed like a sausage. Consequently I think that so far the Murmur is durable enough for a SUL-pack. The Murmur almost has the same amount of features as my Mariposa Plus. Grabbing your water bottle with your pack on is possible. It is also possible to stuff your wet small shelter in the mesh pocket. Personally I would have preferred a bigger more expandable pocket though, since I also like to stuff my raingear in this pocket. The side-straps were useful for fixing my tripod and could also allow me to carry my Tarptent Cloudburst on the side. I haven´t really tested how well they work for compression yet. Although the Murmur doesn´t officially support the Gossamer Gear hip-belt pockets, I used them with the pack with success. The little loop at side of the pockets can be used to attach them to the pack where the waist-belt is attached. The pack also has lashing loops which can be used with bungee cord to attach light items. I found these useful to attach my light Jysk foam pad. To conclude I would say that the Murmur is a pack that works well for a three-day trip in the mountains in summer. Apart from the shoulder-straps there is very little to complain about. And this complaint may well be a personal opinion. The pack also adds a lot of features that the Whisper G6 lacked and which I missed, such as water bottle pockets, pad holder and a mesh pocket. The penalty of 120g extra is well worth paying in my view. It still remains to be seen, but for a SUL-pack I also think it will be durable enough. I can see room in my backback quiver for this pack in the future. I'm already a huge fan of the Gorilla and there are times when I'd like an even lighter, smaller pack with a lot of the same design features. Thankfully, the Murmur is also really affordable so it won't break the bank to obtain one! I've also been using the Murmur a bit so far this summer and agree with what you have written. So far just for daytrips, but it works well for this. In my opinion this is the ideal pack for someone walking between huts in the Scandinavian mountains (or anyplace, why not to Santiago) when you do not need tents or sleeping bags. With a base weigth of 3-4 kilos and some food the Murmur should be ideal. Jorgen - I think so too. For hut-to-hut there is really no need for more carrying capacity. The Whisper G6 was really too fragile and lacking in features, but the Murmur hits the sweet spot I think.As Joe said it´s also quite affordable. Compared to the Jam2 you also save around 400g which is significant when your pack weight is around 4kg. 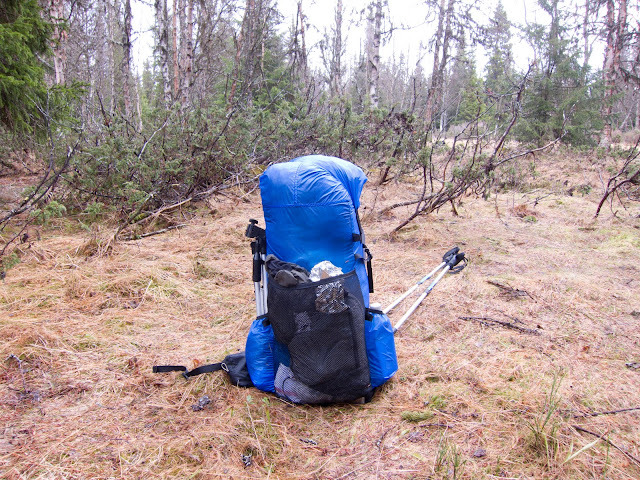 Thanks Gustav for a timely and informative report, I was impressed by your pack on the SBM, and I am looking forward to using mine on many 24 hour trips in the coming months. I expect that with a tarp and bivy as well as other odds and ends the pack will be ideal. Big thanks Gustav! I know own one myself and is so far very happy with it. =) I'm about to head out on a trip tomorrow and since its been quite rainy lately I'm asking myself how rain-resistant the pack is considered its made of silnylon. Have you been using a liner or waterproof stuffsacks? Hi Björn! Glad you like your Murmur! I use waterproof drysacks or waterresistant liners. 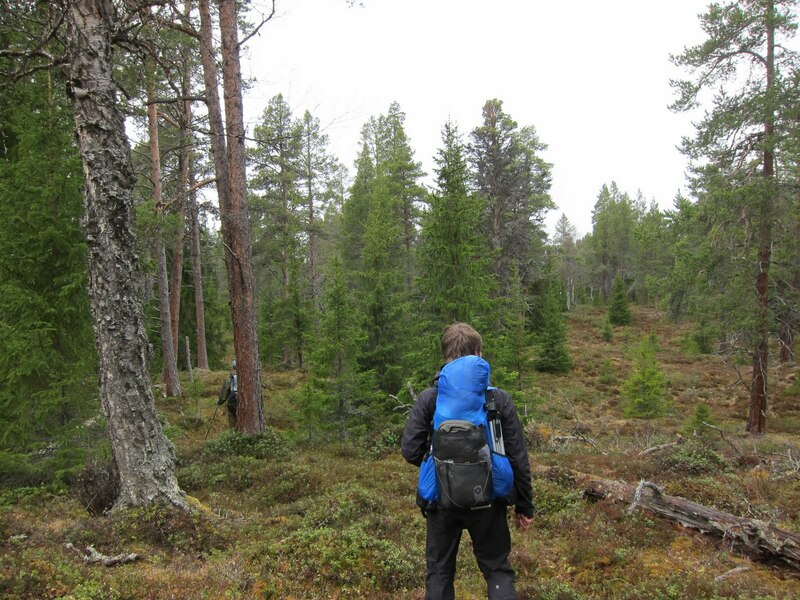 On the Vålådalen-trip we had continuous rain for two days and water definitely leaked into the pack. Mostly I think it is pressed through the seams. I had my insulating clothes packed in a Sea to Summit Ultra-Sil SilNylon pack used as a stuff sack and some water seeped through this pack as well, but not much. If your are out for a short trip you might be OK without drysacks, but on a longer trip I would not count on it. Persistent rain has a tendency to get into everything that is not 100% waterproof. Your sleeping bag should definitely be kept in something completely waterproof.